DAYTONA BEACH, Fla. – Moses Smith is set to make his 60th career start in the NASCAR K&N Pro Series West on Saturday, July 2, at Toyota Speedway at Irwindale (Calif.) in the Southern California Toyota Dealers 200 presented by King Taco. It’s appropriate that Smith, who drives the No. 16 HASA Pool Products/NAPA Filters Toyota for Bill McAnally Racing, celebrate this milestone at Irwindale. He made his series debut at the state-of-the-art half-mile track on July 22, 2006. Since then, the 35-year-old former open-wheel competitor from Tempe, Ariz., has registered 14 top-five and 35 top-10 finishes. He is currently second in the championship standings. But he’s still looking for that elusive first career series win. Smith has come close on several occasions, especially earlier this season when he had back-to-back runner-up finishes at All American Speedway in Roseville, Calif., and Miller Motorsports Park in Tooele, Utah. He knows that first win could come this weekend at Toyota Speedway, where he has registered a string of strong finishes. Of his six starts at Irwindale, Smith finished out of the top 10 only once. His best finish there was fourth last year. The SPEED broadcast schedule for NASCAR’s touring series has been updated to reflect a shift in upcoming air dates.The remaining NASCAR K&N Pro Series West on SPEED schedule is as follows. Unless noted, all air times are 6 p.m. ET. Winner of the an Autographed Chase Authentics - Matt Kenseth Crown Royal Pit Cap was thoughtful enough to send this photo of her wearing her prize. 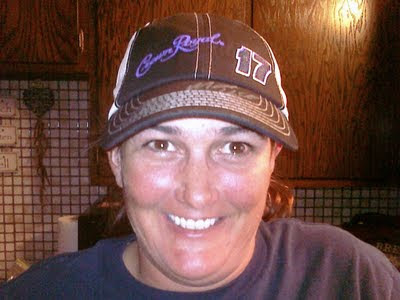 "Got the Matt Kenseth hat last week but am just now getting around to thanking you. Love it & just as I predicted, Bobby's already got it packed away with our NASCAR memorabilia. Thanks again & hope you have a wonderful 4th of July holiday!" Thanks you Cindi - enjoy your prize! The #16 Hasa Pool Products / NAPA Filter Toyota Camry felt right straight off the trailer after arriving at the Infineon Raceway on 06/24/2011. The NASCAR K&N Pro Series West was in Sonoma for a combination event with the NASCAR Sprint Cup Series. Infineon Raceway has hosted twenty-one series races since 1978. Unfortunately, as Smith took the green flag on his qualifying run, his motor failed (threw a rod through the block). The resulting “no time” on the qualifying sheet and required engine change put the #16 Hasa Pool Products / NAPA Filter Toyota Camry to the back of the forty-one car field. The Infineon race which typically attracts one of the largest entry fields of the year, can easily contribute to a driver losing ground in championship points standings. Consequently, the poor qualifying result could have proved very detrimental to the team. “Whoopsie daisy.....blew the darn thing up....didn't even get a lap in. Starting last tomorrow....Hard Charger Award, here I come.” Smith Facebook'ed after his qualifying attempt. The #16 Hasa Pool Products/NAPA Filters team was able to change the engine before leaving the track after qualifying. Starting the race with an untested motor, Smith knew that maneuvering the winding road course in Sonoma from the back would require finesse, patience, and luck. However, the race did not proceed exactly as planned. The team completed their scheduled fuel stop as planned on lap twenty-two. After moving up into the top-ten by lap thirty, it became necessary to pit again for tires, in an attempt to improve the race car’s handling. With almost half of the race completed, Smith restarted the race from the back of the field again. Moses had worked his way back up into seventh place on lap fifty-seven of the sixty-four lapper when a tap from a competitor sent the #16 Hasa Pool Products /NAPA Filter Toyota Camry into a full 360 spin. Smith succeeded in holding on to it and continued without causing a caution. Unfortunately with just seven laps remaining, he had fallen out of the top-ten and was back to twelfth position. The eighth yellow flag on lap sixty-two allowed the cars to group together and Moses was able to regain his positions and finish the race in seventh place. “It was a pretty good day. Finishing seventh made it a really good day for points also.... Now off to Irwindale next week.” Moses stated. As Moses predicted the day before, his charge from the back to the front earned him the contingency award – “Coca-Cola Move of the Race,” commonly known as the hard charger award. NASCAR Sprint Cup Series regulars Joey Logano and David Gilliland finished the race first and second respectively. 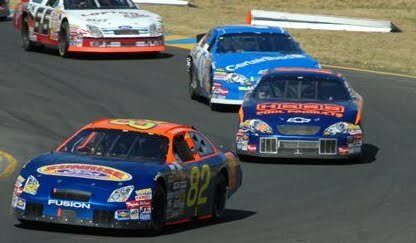 This event is the sixth of fourteen events on the 2011 schedule for the NASCAR K&N Pro Series West. They return to the track Saturday, July 2 for the Southern California Toyota Dealers “200” presented by King Taco at Toyota Speedway at Irwindale. 1. G. Pursley, 1080; 2. M. Smith, 865; 3. E. Holmes, 822; 4. B. Thompson, 804; 5. L. Martinez,Jr., 797; 6. D. Mayhew, 792; 7. M. Self, 771; 8. D. Harr, 725; 9. D. Kwasniewski, 663; 10. R. Philpott, 656. Moses Smith, pilot of the No. 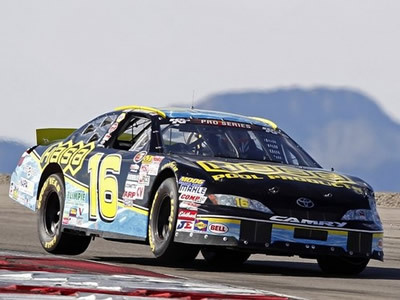 16 HASA Pool Products/NAPA Gold Filters Toyota Camry for Bill McAnally Racing will be racing thru the turns of Infineon Raceway in Sonoma, California as the NASCAR K&N Pro Series West makes its return to the 1.99 mile road course on June 25th. This will be the fifth visit to Infineon for Smith in the West Series. The Thunder Valley Casino Resort “200” at Infineon Raceway will be on Saturday, June 25th. This is a companion race to the NASCAR Sprint Cup Series. 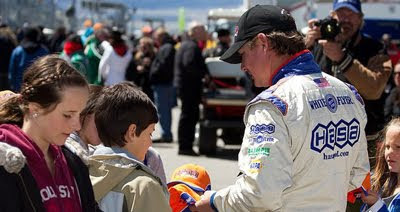 For ticket information, please visit the track’s website at www.infineonraceway.com. Think outside the oval and come cheer for your favorite team in the heart of California’s wine country. DVR Alert: The O’Reilly Auto Parts 200 from the Bullring at LVMS can be seen on Thursday June 23rd on SPEED Channel at 3 pm PST. Please check your local listings. For more information on Bill McAnally Racing and our race partners, please visit our website at www.billmcanallyracing.com. BMR is also home to the BMR NAPA AutoCare where customers can have their vehicle serviced by a championship winning team. Check our website for our latest discount coupons and to make an appointment for service. Bill McAnally Racing is now on Facebook. Become a fan and stay up to date with the latest happenings with your favorite race teams. Also follow the team on BMR_NASCAR on Twitter. For more information on Moses Smith, please visit www.mosessmith.com. You can visit our sponsors’ websites at www.hasapool.com, www.napafilters.com, and www.whiteflyer.com. You can also follow Moses on Twitter. Action packed and very funny! Mark Travis John Sanchez (born November 11, 1986) is a quarterback for the New York Jets. He was drafted in the first round of the 2009 NFL Draft as the second quarterback and the fifth overall selection by the New York Jets. Now Sanchez has teamed with Degree Men to help determine his new off-season training schedule and get him ready for next season. Degree Men is all about challenging guys during adrenaline-fueled moments, and as a QB, Mark is always under pressure. Through the Degree Men Facebook page, fans voted for Sanchez to train with the JR Motorsports Pitcrew and Orange County Fire Brigade. Last month, he visited the Charlotte Motor Speedway to experience, firsthand, the adrenaline rush of NASCAR. With the help of JR Motorsports and Aric Almirola, Driver of the No. 88 Degree Men Chevrolet, Sanchez learned what it takes to be a pitcrew member and the stomach that is necessary to drive around the race track at nearly 200 MPH. I must say that I am so jealous of the JR Motorsports tour that Mark experienced. What a great opportunity to learn about NASCAR from the inside out. You can view more videos on facebook. Sanchez has been spotted at the NASCAR tracks several times since the videos were shot. Most recently he was at Pocono with Jimmie Johnson. Don’t be surprised if Sanchez declares a new sport if the NFL lockout continues. HACKETTSTOWN, N.J. (June 15, 2011) --- M&M’S® fans, start your engines! Mars, Chocolate North America announced today that it is revving up race day excitement among all consumers with the launch of the 5 Characters, 5 Cars…Pick the Car You Want! promotion. Consumers will purchase participating M&M’S® items from specially marked displays in stores and enter a UPC code online for their chance to win one of five Toyota models from the sweepstakes drawing. Each car is aligned with a different fun-loving M&M’S® Character: Red with the Toyota Tundra, Yellow with the FJ Cruiser, Green with the Camry, Orange with the Prius and Blue with the 4Runner – as consumers enter the sweepstakes, they will choose which of the five cars they would like to be eligible to win. With each sweepstakes entry, consumers also have a chance to instantly win additional prizes including NASCAR® merchandise, gas cards and cash. For more information on the M&M’S® NASCAR® partnership, the 5 Characters, 5 Cars…Pick the Car You Want! Promotion and for your chance to enter, please visit www.mms.com/us/racing or www.facebook.com/mmsracing. 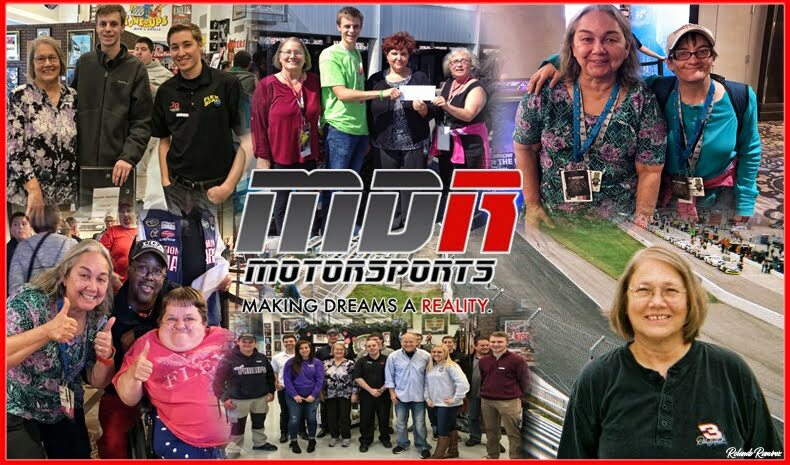 NASCAR Race Mom would love to win a new Toyota Tundra Double Cab 5.7L V8 4x2. Therefore NRM rushed over to the www.mms.com/us/racing website. For completing the quick registration – you are given a free UPC code to play. While I didn’t win one of the instant win prizes, NASCAR Race Mom was entered for a chance at one of the five Grand Prizes, a new Toyota! One (1) 2011 Model Year Toyota Camry SE V6 (Model 2550), equipped with leather & navigation system; Approximate Retail Value (“ARV”): $30,000. One (1) 2011 Model Year Toyota Prius (Model 1227), equipped with navigation package; ARV: $30,000. One (1) 2011 Model Year Toyota FJ Cruiser 4×4 (Model 4704), equipped with convenience & off-road packages; ARV: $31,000. One (1) 2011 Model Year Toyota 4Runner SR5 4×4 (Model 8664), equipped with convenience & premium packages; ARV: $36,000. One (1) 2011 Model Year Toyota Tundra Double Cab 5.7L V8 4×2 (Model 8241), equipped with SR5 package, backup camera & tow package; ARV: $32,000. One Hundred (100) Game First Prizes: each, a M&M’S® branded $50 smartOne® Discover® Gift Card. Two Hundred Fifty (250) Game Second Prizes: each, a M&M’S® Brand Tailgate Chair; ARV: $25. Five Hundred (500) Game Third Prizes: each, a $25 the NASCAR.COM Superstore Gift Certificate (awarded as a electronic code redeemable on NASCAR.COM). Six Hundred Fifty (650) Game Fourth Prizes: each, a M&M’S® Brand Racing Cooler; ARV: $25. One Thousand (1,000) Game Fifth Prizes: each, a M&M’S® Brand Diecast #18 Car (1:64 scale); ARV: $10. Remember you must enter in order to win! Please let me what you win. I will be sure to enter again tomorrow. You can enter five times daily. 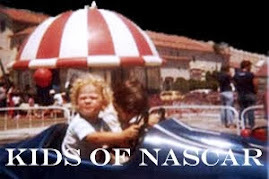 Disclosure: NASCAR Race Mom will be compensated by M&M’S® with product (customized M&M’s) . However, NRM would have been pleased to share this news with my readers without said compensation. Congratulations to RobinN, Cindi0420, and Daniel Thornton - the winners of an Autographed, Chase Authentics, #17 Matt Kenseth Crown Royal Pit Cap! Remember Crown Royal says "please drink responsibly." They represent quality over quantity. Be sure to check out the Crown Royal facebook page by clicking here . Saturday’s O'Reilly Auto Parts 200 marked the NASCAR K&N Pro Series West's first visit to the Bullring since 2003. The weather peaked at 96 degrees and was windy. The Bullring offered family entertainment at family-friendly prices. The concession stand features $1 hot dogs, $1 sodas and $1 beer. 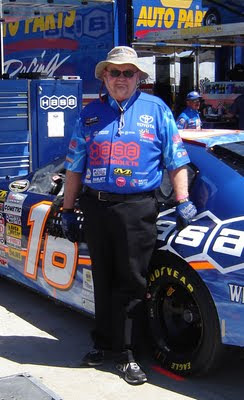 However, Las Vegas, Nevada was not too lucky for the #16 Hasa Pool Products / NAPA Filter Toyota Camry. After qualifying thirteenth, Moses had patiently worked his way into eighth position. Unfortunately, his charge to the front was hampered on lap 81 when his car went up in smoke. “What a tough night for us. We had a good car, but went eleven laps down when I had to come in to fix a low oil problem.” Moses finished the race in twentieth place. The O’Reilly Auto Parts 200 will air on SPEED on Thursday, June 23 at 6 p.m. ET. The next event on the 2011 schedule for the NASCAR K&N Pro Series West will be the Thunder Valley Casino Resort 200 at Infineon Raceway in Sonoma, Calif., on Saturday, June 25. Greg Pursley leads the championship standings with 920 points. He is followed by Moses Smith with 719, Martinez with 715, David Mayhew with 701 and Brett Thompson with 686. Completing the top 10 are Self at 683, Holmes at 657, Jonathon Gomez at 647, Daryl Harr at 631 and Kwasniewski at 578. 9:00 a.m. Haulers enter. Registration opens. 10:00 a.m. Garage opens. Inspection begins. 11:00 a.m. Mandatory Rookie Driver Meeting. 11:30 a.m. Mandatory Driver/Crew Chief Meeting. Draw for qualifying order. 12:45 to 1:30 p.m. Practice. 2:15 to 3:00 p.m. Final Practice. 3:30 p.m. Qualifying Inspection begins. Groups by qualifying draw. 5:30 p.m. Qualifying. (2 Laps. )"Impound"
6:15 p.m. Mandatory Spotter Meeting. 6:15 to 6:55 p.m. Driver Autograph Session. 9:00 p.m. O'REILLY AUTO PARTS "200"
Antelope, CA (June 5, 2011)–Bill McAnally Racing driver Moses Smith and the No. 16 HASA Pool Products/NAPA Gold Filters Toyota team are looking to give team owner, Bill McAnally a third victory at the Bullring at Las Vegas Motor Speedway. Smith is coming to the Bullring to compete in Saturday's O’Reilly Auto Parts 200 NASCAR K&N Series West event. The series has made only 3 previous visits to the d-shaped short track just north of Las Vegas. Bill McAnally Racing’s Austin Cameron put the NAPA entry on the pole in 2002 and brought home the victory. The following year, veteran driver Jim Inglebright piloted BMR’s Jellybelly entry to Victory Lane after leading the most laps and starting on the pole. The Bullring is not new to Smith. 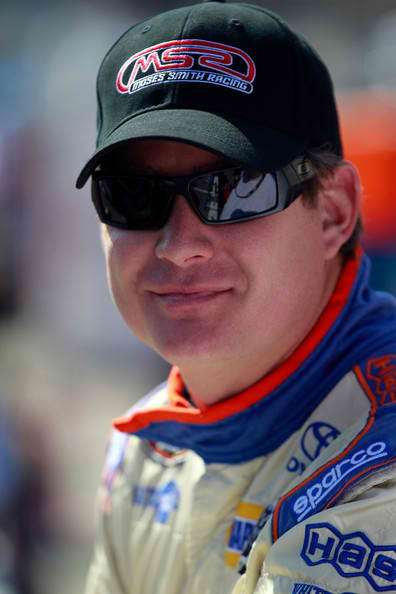 He ran a full season in the ASA Speed Trucks in 2005 where he brought home a second place finish in three starts. Smith and the No. 16 HASA Toyota team are currently second in the chase for the West Series championship with ten races left on the schedule. 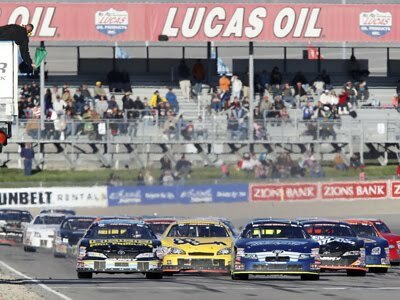 Joining the NASCAR K&N Pro Series West Series June 11 will be the NASCAR Super Late Model, NASCAR Charger, NASCAR Bomber, Legend Cars and Bandolero classes. Spectator gates will open at 4 p.m. for this event. General admission parking always is free. Tickets may be purchased in advance at the LVMS ticket office or by calling (800) 644-4444. For more information, please call LVMS at (702) 644-4444 or visit www.LVMS.com. The O’Reilly Auto Parts 200 can be seen on Thursday June 23rd on SPEED Channel at 3 pm PST. Please check your local listings. 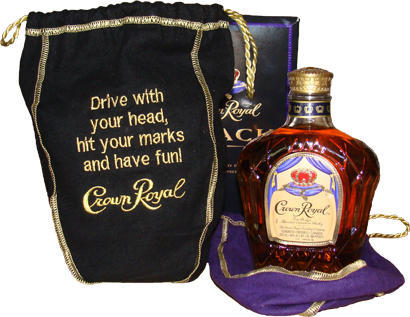 Want to win a customized Crown Royal bag for yourself or as a gift? There are three prizes available. Entering to win one of the three Crown Royal personalized bags is easy. However, please be sure to follow the instructions below to be entered correctly. 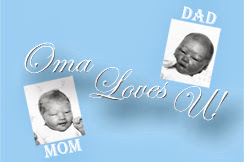 Enter the "Go Moses Contest" to win a trip for four to the 2012 NASCAR Daytona 500 - Click Here to Enter; then come back to this post and comment that you entered. Enter the "Autographed Matt Kenseth Cap Giveaway" to win a Matt Kenseth autographed #17 Crown Royal Pit Cap - Click Here to Enter; then come back to this post and comment that you entered. USA residents over the age of 21 only. Dad’s Day is just around the corner. Now honestly, after thirty-six years of marriage and the raising of two delightful and productive sons; finding an “original” gift for my husband can become quite a tedious task. However, this year NASCAR Race Mom was very lucky. Due to an earlier meeting with some Crown Royal staffers, I discovered their Custom Bags Program. NRM learned that you can upgrade your bottle of Crown Royal, to go from great to extraordinary, by adding your own message to the bag. Adult consumers can visit www.crownroyal.com and click on “The Bag.” It is easy and quick to personalize the famous velvet covering with your words sewn on in Crown Royal’s classic gold trim. Needless to say, they make fantastic presents, too! I quickly settled on my husband’s favorite advice to Moses before his races, “Drive with your head, hit your marks, and have fun!” While my husband is not much of a drinker, he loves to entertain. Paul serves as both the cook and bartender at all our social gatherings. I knew that he needed a new bottle of Crown Royal to serve his guests. His new custom bag will make his presentation even classier. The personalized bags sell for $9.95. Of course Crown Royal reserves the right to deny printing messages that could be considered to be obscene, in poor taste, or which relate to the irresponsible consumption of alcohol beverages. You can follow Crown Royal on facebook . Congratulations to Gena M. from Moore, OK, our Moses Smith Racing "Win A Trip To Watch Moses Race In Las Vegas!" contest winner. A big "Thank You" to sponsor Las Vegas Motor Speedway. Please stop by Las Vegas Motor Speedway and The Bullring at Las Vegas Motor Speedway on Facebook to thank them for this wonderful promotion! Remember to tell them that NASCAR Race Mom sent you!